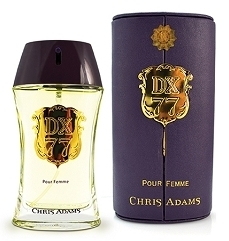 DX 77 - Pour Femme (for women) - Eau De Parfum - Vaporisateur - Natural Spray - 80ml - 80% vol. - 2.4 fl. oz. Designed for the graceful, elegant women. A wonderful combination of fruity notes, this fragrance is a unique blend of passion fruit, apple and raspberry. A cameo by magnolia lends a touch of sophistication. The fragrance is held in a tinted bottle, simplistic and elegant in its form, with a coat of arms as the single embellishment on it.